JGS4x4 Land Rover Parts and Accessories. Official stockists for Bearmach, Britpart & Allmakes 4x4 quality Land Rover parts. Genuine, OEM and aftermarket Land Rover Parts and accessories for all Land Rover models. Including Defender, Discovery, &###xA0;Freelander, &###xA0;Evoque and Range Rover. &###x200B;&###x200B;&###x200B;&###x200B;&###x200B;&###x200B;&##x200B. &###xA0;1,2 & 3. 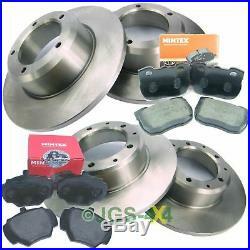 Land Rover Discovery 1 300TDi Front & Rear Brake Discs + MINTEX Brake Pad Kit. Whilst we make every effort to describe items carefully and accurately we cannot be responsible for compatibility issues where a vehicle has been modified or changed from factory standard. All parts listed, are presumed to be for. Spec Right Hand Drive RHD cars unless otherwise described. A set of replacement front and rear brake discs and pads. These are quality replacement parts. The brake discs will be either Bearmach or Allmakes 4x4 branded and the pads are Mintex. JGS4x4 Limited is a long established family run business specialising in quality Land Rover Parts and Accessories for all Land Rover models including Defender, Freelander, Evoque, Discovery, Series, Range Rover and Range Rover. We hold a huge range of items in stock in our custom built 7000sq foot warehouse. Our state of the art computer system takes care of the order fulfilment processing, packing, scanning and dispatch process ensuring that we are able to pick and pack orders very quickly. We are proud to be official stockists for Bearmach, Allmakes 4x4 and Britpart from whom we source all manner of aftermarket, OEM and Genuine Land Rover parts and accessories. Please make sure you pay for your items within 24 hours. We automatically open unpaid item cases for non-payers. Can help you to cancel the order. We do everything we can to make sure your order is delivered on time. Most orders for stocked items received before 12&##xA0. Heavier orders over 2Kg are sent by a&###xA0;Two Day courier depending on the postcode. AB31-38, AB41-56, BT, FK17-21, G83, GY, HS01-09, IM, IV, JE, KA27-28, KW0-99, PA20-99, PH15-99, TR21-25, ZE. All courier deliveries to Highlands and Islands are 2-5 days and NOT next day. Overseas&###xA0;Orders - Europe & Rest Of World&##xA0. We can only accept the return of opened items if they are faulty. We cannot accept items over 30 days unless they are faulty. You will be responsible for the costs of returning the items to us unless we delivered the item to you in error, or if the item is damaged, faulty or defective. When returning any item, make sure you include a copy of the invoice or invoice number and a note explaining the reason for return. JGS4x4 are authorised distributors for Allmakes 4x4, Bearmach and Britpart Land Rover parts and accessories. We stock and sell many different brands including genuine, branded and aftermarket parts. Due to availability issues from suppliers, the brand supplied may vary and be different in colour, brand or appearance from that shown, unless we specify a particular brand then we will, whenever possible, supply that brand. We are a UK based business, all parts meet current UK specifications. Genuine, OEM and Branded Parts. The item "Land Rover Discovery 1 300TDi Front & Rear Brake Discs + MINTEX Brake Pad Kit" is in sale since Thursday, September 8, 2011. This item is in the category "Vehicle Parts & Accessories\Car Parts\Brakes & Brake Parts\Brake Component Packages". The seller is "jgs-4x4" and is located in Kettering. This item can be shipped to North, South, or Latin America, all countries in Europe, all countries in continental Asia, Australia.